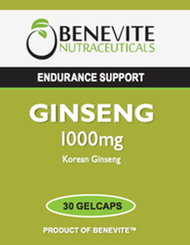 Benevite Nutraceuticals™ Ginseng 1000mg enhances stamina and endurance and also helps to reduce fatigue. Ginseng came to the west via traditional Chinese medicine. In Chinese medicine ginseng is said to replenish vital energy and promote health. In western herbal medicine it is classified as a tonic herb. A tonic herb can revitalise the body as a whole and increase the overall wellbeing of a person by supporting energy levels and reducing fatigue. During times of high physical and mental demand ginseng can enhance stamina and endurance. It can help to maintain peak effort during times of excessive exertion. By increasing energy levels and reducing fatigue, ginseng can assist with convalescence after illness. Ginseng has been shown to improve the body’s stress-coping mechanisms, largely through its effects on the adrenal glands. 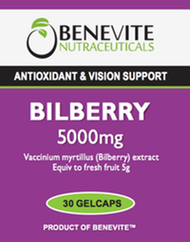 It enhances concentration and work efficiency. Adults: Take 1 capsule twice daily with meals, or as directed by your healthcare professional.